The Print Service Invoices application produces service invoices that reflect the activity you previously entered into Service Invoice Processing. These are usually generated on pre‑printed forms. But you can also print them on any form that is defined in the Invoice Form Setup application. 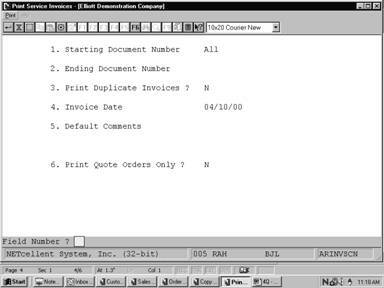 Elliott Business Forms Department of NETcellent System, Incorporated can supply invoice forms in a wide range of colors at very competitive prices. 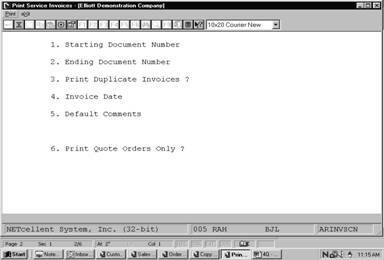 When you select Print Service Invoices, an input screen requests further information, such as the range of invoice numbers to be printed, the corresponding invoice date, as well as any special comments that you want to print. Invoices may be printed on either standard (continuous) forms or laser forms. To use the default laser form layout, select the Laser option under Reset in the Invoice Form Setup application. Make sure the Default Invoice Form field (#37) in A/R Setup is set to 99. For more information on invoice formats see the Invoice Form Setup section of this manual. 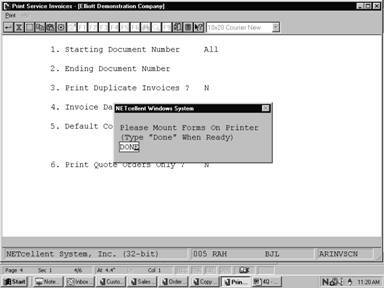 To actually set the system to print on laser forms, set the Print On Laser Forms? field #48 in the A/R Setup application to I or B. Enter the first document number within the range you wish to print. To select all orders, press RETURN. Enter the last document number within the range you wish to print. Press RETURN to default to the starting document number's entry. 3. Print Duplicate Invoices ? If Y is entered you may re-print the range of Unposted service invoices again. This field defaults to N.
This is the date that a given service was performed, or any date that is specified as the invoice. The system defaults to today's date. 3 lines of 35 characters each. You may enter any additional comments here. 6. Print Quote Orders Only ? 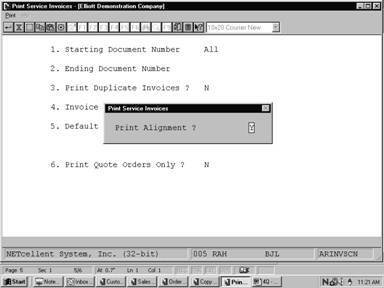 If Y is entered, only those service invoices with a document type of Q (Quote) will be printed. This field defaults to N.